This recipe was sent to me by a reader who lives in Germany. She wrote that she always makes these gingerbread boys every Christmas, not for her children, but for her husband of forty-three years. Making these gingerbread boys is a big part of their holiday celebration and has become a much-enjoyed tradition for both of them. She urged me to try this recipe for myself and if I liked it, to share it with my readers, but to please not post her full name. So here is the recipe… thank you Waltraud (Walli) for sharing your recipe… and your story. 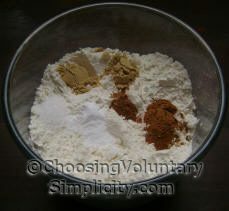 Measure all the dry ingredients together into a large bowl. Mix all these together thoroughly (a whisk works great). 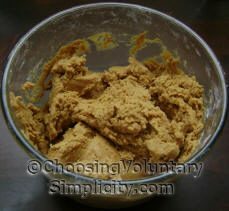 Cream the butter and brown sugar together until the mixture is light and fluffy. Beat with a large spoon or on high speed if using an electric mixer. Beat in the molasses, egg, and vanilla. 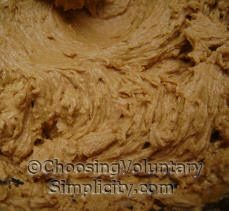 Continue beating the mixture by hand or on high speed until the consistency is smooth and creamy. 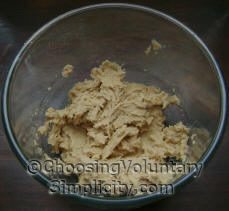 Gradually mix in the dry ingredient mixture, but do not over-beat. Mix by hand or using the mixer’s low speed only until all the ingredients are well combined. Overmixing at this stage will make the cookies tough. 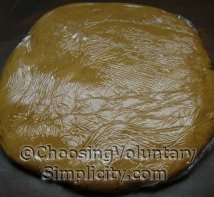 Wrap the dough in plastic wrap and refrigerate for at least three or four hours. Chilling makes the dough easier to handle. I like to roll out only a portion of the dough at a time and position my cutter so I don’t have to keep re-rolling the dough. This helps to prevent too much handling of the dough or adding too much flour, which will make the cookies tough. I keep the rest of the dough cold until I am ready to roll it out. Preheat the oven to 350°F. Lightly flour your work surface. 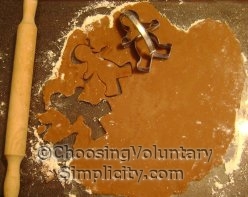 Roll the dough out to a 1/4-inch thickness and cut gingerbread boy shapes with a cookie cutter. If you don’t have a cookie cutter, cut a gingerbread boy shape out of cardboard, place it on top of the rolled dough, and use a sharp knife to trace around the shape. 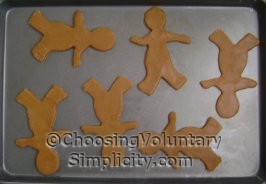 Slide a metal spatula under each gingerbread boy and place them approximately one inch apart on ungreased baking sheets. Bake for eight to ten minutes. The cookies are done when the edges are just starting to lightly brown. Leave the cookies on the baking sheet for a minute or two, then use a second or washed spatula (don’t forget, there is a raw egg in the unbaked dough) to remove them to racks. Let the cookies cool completely before decorating. Decorate your gingerbread boys to give them personalities. This can be a fun family project. For this group we used white butter cream frosting and kept our decorations very simple… last year we added hair, clothes, and smiles and frowns, and made each cookie different. The decorations can be as simple or as fancy as you wish. These are great cookies. I only made round cookies but I love the taste and they turned out really good. This is a great blog. I really enjoy it. My 9year old granddaughter and I made these gingerbread men the day after Christmas. She is just learning to cook and she followed your photos and instructions without any problem whatsoever. She was so proud when she served her gingerbread boys to her brother and mother and father. You can bet this Grammy was pretty proud too! Keep up the great work. Those gingerbread boys in the top picture looked so happy and inviting, I just had to try this recipe with my children. I’m not really a baker so I appreciated your step by step illustrated instructions. 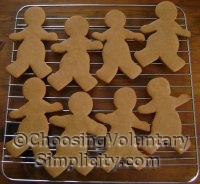 My boys and I just took it a step at a time and we ended up with the cutest and most delicious gingerbread boys ever. I think this is going to end up as a new Christmas tradition because my youngest is already asking if we can do it again next Christmas. Thanks for this blog, I always get such good ideas when I come here. I need to make these. They look like a lot of fun. And did you know that if you don’t have cake decorating “tools”, you can put frosting in a plastic syringe, (I have them because we have farm animals), or a zip lock bag with a tiny hole in one corner, and squeeze out just the amount you need in a tidy stream?